Search on Pubmed and Pedro with keywords: “wrist sprain”, “sprained wrist”. Search in libraries books about sports injuries, injuries of the upper extremity. 1. A mild overstretching of the ligaments, without joint instability. 2. A partial rupture of the ligaments, with no or mild joint instability. 3. A complete rupture of a ligament with severe joint instability. Representation of the various ligaments susceptible to sprain at the wrist joint. 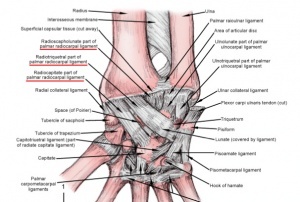 There are two types of wrist sprains, namely radial and ulnar wrist sprain. Beware this can be very painful or even impossible for patients with a severe wrist sprain, when the passive mobilizations are already painful and not fully practicable. 4. Elevate: Try to keep the wrist above heart level as often as possible, during two days. This will help drain fluid and reduce swelling around the wrist. - turning the wrists: hook you fingers into each other and turn the wrist in different directions. - Place you forearms on a table and perform extension (arm in pronation on table) and flexion (arm in supination on table). - Do the same for ulnar and radial deviation, you can do this one in pro- and in supination. 2. Prof. Dr. R. Meeusen. Praktijkgids pols- en handletsels. Vrije Universiteit Brussel. Dienst uitgaven, 2006. 4. Roald Bahr, Sverre Maehlum. Clinical Guide To Sports Injuries. 2004. 8. Peter Vaes, Eric Kerckhofs, David Beckwée. Het Gezondheidsprofiel. Standaard uitgeverij.